Thailand is known for its crazy outdoor market scene but this was like nothing I have ever seen before. 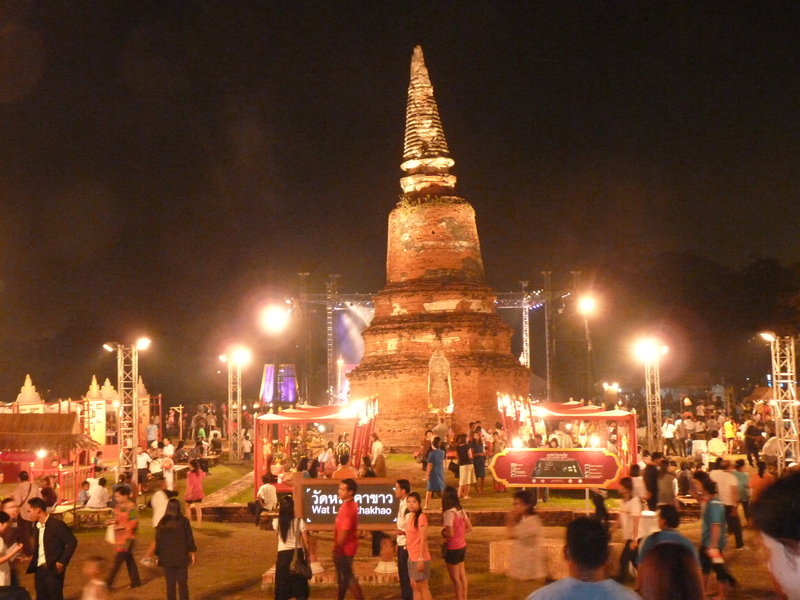 Starting just before dark, the grassy field transforms into individual food stalls- each vendor selling their specialty dressed in traditional Thai clothing. In the center of this pseudo market, women were dressed like Thai mannequins, posing for pictures with foreigners and Thai’s alike. The highlight was the floating market. 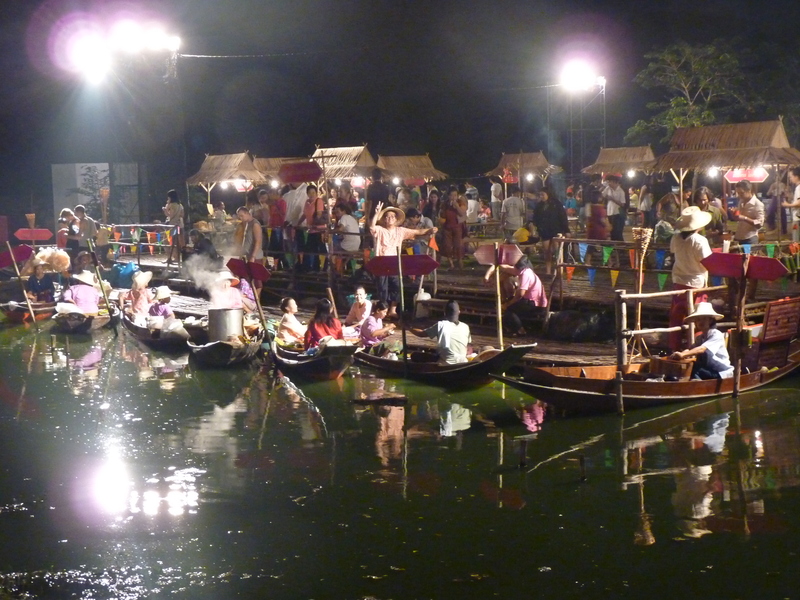 In the stream between Wats, a few food vendors anchored their wooden long boat and set up shop. Sean and I walked over one night after dinner to see what all the commotion was about and were both a little speechless. Needless to say, after finding chicken roti with a spicy cucumber relish, we ended up having two dinners that night. The stalls were shutting down and we vowed to come back and get the real experience… oh, and see the one hour show that was responsible for the consistent firework show. Thai’s learn the art of dance, song and performance at an extremely young age (as English class is constantly cancelled to practice some routine or another). 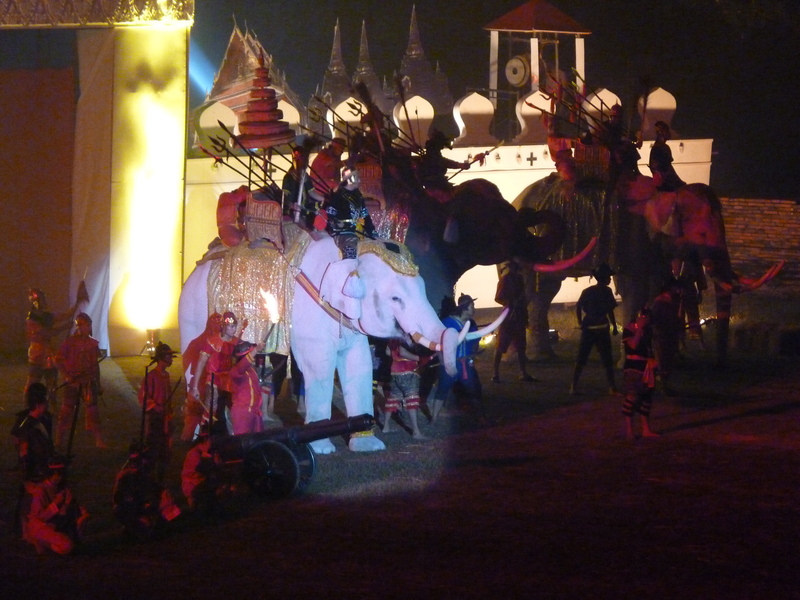 The show was centered around the history of Ayutthaya, specifically the battles leading up to the sacking of the city by the Burmese in the eighteenth century. The stars of the show were the white elephants (yes, these are real animals, not just a present-giving game played around the holidays). Not only are they the most beautiful animal I have ever laid eyes on, but brilliantly trained by their Mahuts. 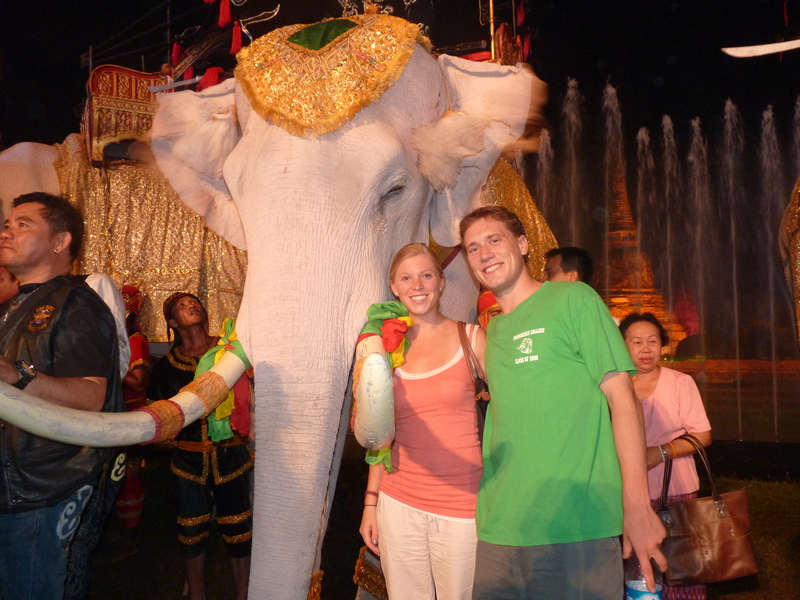 The white elephants were used in each fight scene, always with the Thai or Burmese king perched on their neck. The stunts that these animals pulled off were nothing short of amazing. 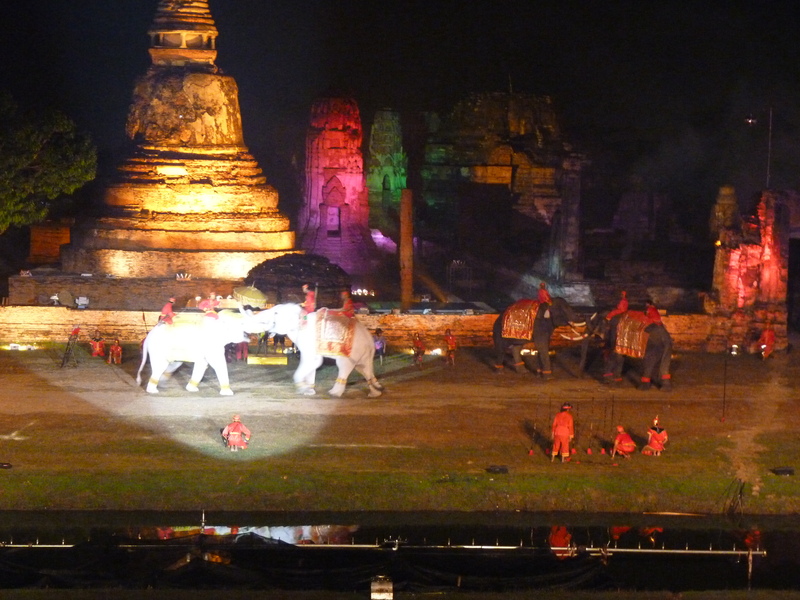 The most memorable scene was during a Thai-Burmese battle, the Thai white elephants chased a Burmese soldier, destroying everything in its path (basically like a bulldozer) ripped the spear out of his hand, and threw him into the river. 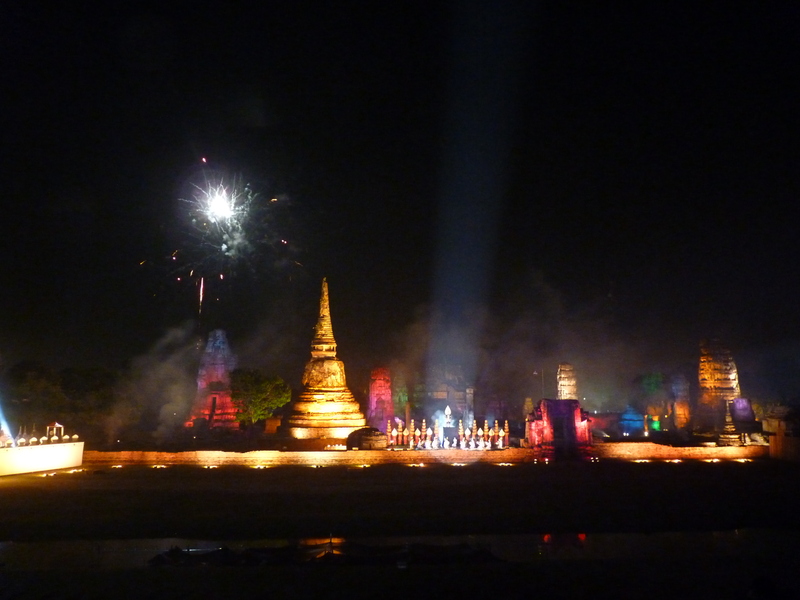 The rest of the show was filled with a re-enactment of Wat Maha Tat burning to the ground, fireworks and an incredible light and sound show. Even thought the entire show was narrated in Thai, it will stay in my memory as the best performance I have ever seen. OMG what a spectacular! You must have loved every minute of it. Can we see something like that when we come!?! WOW. That sounds absolutely amazingg! Almost Disney-esque haha. Enjoy the holiday season!